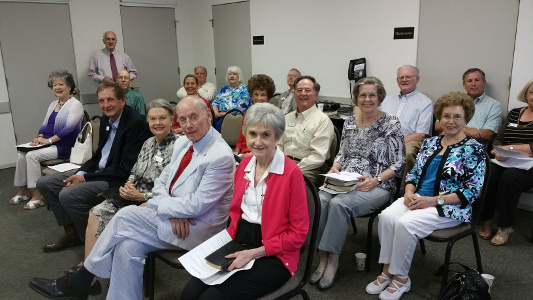 Historically the Bible Alive class was the first Bible Study at The Church at Horseshoe Bay. Rev. Ken Forshee started it on January 21, 1990. It was called simply the Bible Study and met in the Breedlove Building where the church office was located. This was while the Sunday worship services were at the Chapel before the present building was constructed. The first services in the present church building started November 15, 1993 and the Bible Class met in what was then the nursery but is now classroom 3. In March of 1994 Rev Forshee announced that he would not be available the next Sunday and asked if anyone would like to lead the class. Reluctantly Art Hawkinson volunteered. He served as backup teacher to Pastors Forshee and John Long until 2000. In February 2000 the first teaching team consisting of Larry Canter, Art Hawkinson, Bruce Hennie and Jim Jorden began with the Visual Survey of the Bible. Other books of the Bible followed. In September 2006 the Women’s Class began and the Seekers Class in 2008. The last of the current classes, the Faith Bridge Class began in the fall of 2013.
and applied – that’s what makes the Bible come Alive in our lives. 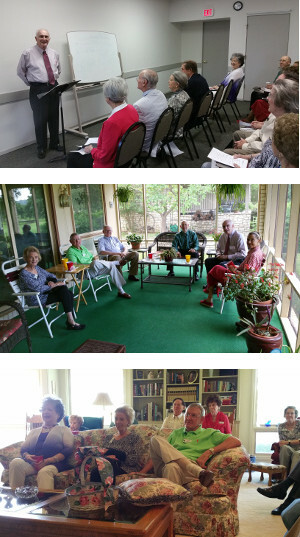 Our teaching team includes Larry Canter, Art Hawkinson, David Sweigart, Mary Ellen Keith, and Larry Sherwood. Come join us Sunday morning at 9:45 a.m. for Bible Study in the education building, classroom 3. Class socials are held twice a year in various member homes.